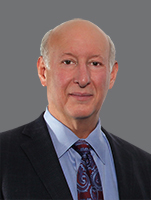 Simon Caplan, a Principal with Cushman & Wakefield | CRESCO Real Estate, has been in the construction and real estate industry for over thirty (30) years. Simon began his career with Cushman & Wakefield | CRESCO Real Estate as Vice President in 1998 eventually transitioning into a Principal role in 2001. Simon’s personal experience representing both tenant and landlord, and buyer and seller on real estate transactions allows Simon to quickly ascertain clients’ needs. Simon averages over 30 transactions annually, including both sales and leases ranging from 1,500 to 500,000 SF and land sales from 1 to 60 acres. Simon has achieved multiple land sales at Northeast Ohio’s highest price for industrial land. Simon’s assistance on due diligence matters has more than proven his worth to his list of many repeat clients. Simon strives to maximize value for his clients by using his knowledge, his experience, his tenacity and out-of-the-box thinking to provide top of the market results. Majestic Steel/Landerwood Crossing/Relocated the corporate office headquarters of NE Ohio’s largest specialty steel supplier and service center. Airgas/Weyerhaeuser/Assisted Airgas in establishing a location for a new major full-service filling facility in NE Ohio while providing a dramatic cost savings to the client. FMI/Solon Town House/Assisted in the relocation of the US headquarters for a facility to design, develop, test and manufacture of a new high-tech CAT Scan Imaging system. GLT/Consulted on the acquisition of five (5) large industrial properties, all still owned to house their growing manufacturing companies. Land Sales/Consulted on more than thirty (30) transactions covering over 300 acres for a multitude of uses including industrial, retail, office, multifamily, senior citizen, and hotel, achieving top of the market sale pricing, while assisting with complicated due diligence issues including rezoning, easements, wetlands, environmental and adverse building conditions. Successfully represented Sellers on 62 acres that had multiple title and other legal issues. Simon was able to work with the Buyer’s attorney and the title company to conclude the sale. Assisted Heatseal/Premier with the relocation of the 85,000 SF headquarters/manufacturing facility of packaging and processing equipment for the food industry. The new location, a former soda pop manufacturing plant, required significant buildout which we were able to negotiate with the new landlord, who just recently purchased the building. Sold two (2) multi-family projects one with 240 suites in Solon, Ohio and one with 82 units Lakewood, Ohio. Both transactions had multiple offers, however, we were able to negotiate hard earnest money deals with quick closing periods. 5440 WARNER RD 5440 Warner Rd. MIDCON A 7235 Free Ave.
TWINSBURG BUSINESS PARK 2479 Edison Blvd. LAND-ROCKSIDE WOODS BLVD Rockside Woods Blvd. 6573 Cochran Rd. 6573 Cochran Rd. ROCKSIDE WOODS LAND East Brecksville Rd. ROCKSIDE WOODS LAND Corner Brecksville Rd.